In 2017, a United Kingdom-based group of explorers, adventurers, and creators of the YouTube channel “Exploring With Fighters” visited Pink Floyd member David Gilmour’s abandoned mansion. Gilmour joined the band in 1968 as a guitarist, not long before founding member Syd Barrett left the group. He was with Pink Floyd as they grew to become one of the most revered and best-selling bands and music history. After the departure of Roger Waters, Gilmour took the helm of the group and released three more albums until they disbanded. Now, we can take a look into his abandoned mansion which has remained essentially untouched. Gilmour owned the house until 2007, where he then sold it to somebody who left it abandoned until today. 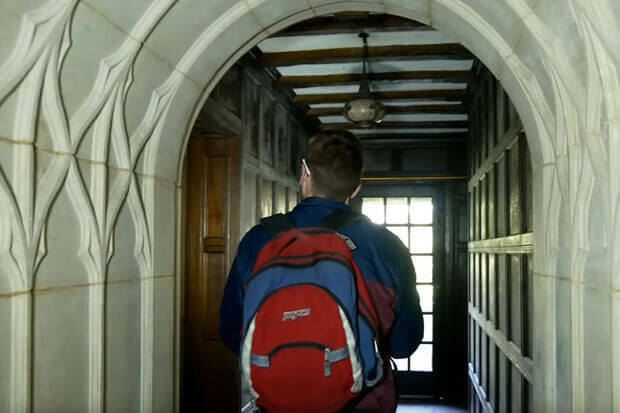 While the Exploring with Fighters crew released their video of the mansion in September of 2017, they claimed that people had known about it since February of that year. Surprisingly, the house remained essentially undamaged with the furniture still intact, as well as many of the decorations and art untouched. The door was even unlocked when the crew reached the premises. It was clear that whatever amount of people had visited the abandoned mansion prior showed the home respect. Considering that the mansion was abandoned and the front door was essentially wide open, the crew was baffled at how much of the house remained intact. Usually, if a place has been abandoned, it doesn’t take long for it to be vandalized several times over. Also, the fact that it was the home of a former Pink Floyd guitarist, you would expect that countless people would visit the location. With that much traffic, it’s expected that some fans might cause some problems. Upon entering a room dedicated to snooker, a game played in the United Kingdom, the boys were amazed by what they saw. The space was in pristine condition with the balls on the table already arranged as if somebody was about to start a game. Even after 10 years, the table had held up extremely well and the walls were decorated with pictures from the past showing people playing the game in the exact room. The crew couldn’t believe they were standing where Pink Floyd stood, most likely discussing music over a game of snooker. While the rooms that they had visited at first all seemed to be in order, they came across something rather strange upon leaving the snooker room. In what appeared to be a small sitting room, there were piles of blankets and pillows on the floor. However, they didn’t think much of it because nothing was damaged. If it was from someone else it was relatively harmless, but it could also have been done when Gilmour was moving out of the house and decided to leave the items behind. There were enough shelves and surfaces to fill a library, and amazingly, almost all of them had decorations, art pieces, or old books on top of them. While it was doubtful that Gilmour spent his days reading 19th-century dictionaries, they certainly added to the aesthetics of the house. It was truly astonishing how many interesting trinkets and displays there were all over the house that had simply been left there. Of course, anything that the team touched or looked at, they put back right where they found it. After walking into what seems to be one of the many dining rooms, which were still in great condition, the team came across a piano. However, this wasn’t just any old piano. It was a Eungblut & Eungblut London piano, a very nice piano. This was unsurprising considering they were in the former home of one of the world’s most legendary rock musicians. While the piano was still in incredible condition, the only problem was that it was out of tune. But then again, what do you expect after 10 years? In numerous rooms around the house, it was like someone was still living there. One of the dining rooms looked completely untouched with items still on the table and the chairs pushed in as if nobody ever left. Amazingly, it almost looked like the table had been dusted as it hadn’t undergone much change in the 10 years that it hadn’t been used. It’s refreshing to think that nobody had the idea to come and loot all of this fine furnishing. While many of the rooms still seemed to be in excellent condition, in a mansion that big, some areas were bound to suffer from the lack of attention. Although one room might have looked good, going through a random door in the hall might take you to a room where the wallpaper was peeling or the ceiling was slightly collapsed. Even though it might have been a bit more dangerous, this only made investigating these areas more exciting for the Exploring with Fighters team. While many people assume that abandoned houses, and especially mansions, are the perfect place to throw parties and destroy things, that wasn’t the case for this house. Exploring with Fighters explained that the place had been known about for months and they knew that they weren’t the first people to have a look around. Some of the signs that they saw of people being there prior were board games that looked like they were taken off the shelf and been played with. No breaking down walls here, just a few people sitting around playing a game. When one of the boys found a book that simply said “2005” on the cover, they decided to crack it open and take a look inside. It was clear that it was a planner for the year 2005. Yet, there appeared to be nothing in it… to their dismay. However, after flipping through the back of the book they found some writing. They were curious and eventually discovered that they were actually recipes. The real question was if they were written by Gilmour? After leaving the kitchen area, the team worked their way toward a room that they figured to be a child’s room. It was pretty obvious considering that it was covered in child-like wallpaper and that all of the shelves were filled with toys and other kinds of childish knick-knacks. This room actually a pool table, unlike the other one which had the more adult game of snooker. However, there didn’t seem to be any room for a bed, so they assumed that it was just a playroom. As they continued through the labyrinth of a home, Exploring with Fighters stumbled across a maid call box. The house is so ginormous that when it was lived in years ago you could press a button so your servers would know which room to go to. This is because you could scream at the top of your lungs on one side of the house and nobody would ever hear you. This was likely pretty advanced technology when this device was first installed. You won’t believe what they found in the basement. As the explorers went down into the basement, it was pretty much how they had expected to find it. It was dark, damp, dirty and, essentially falling apart. While there were still a lot of interesting objects to look at, the group came across something that was rather odd. In a small room part of the basement, they found a tombstone. As they got closer they saw that it read: “Little Jack – April 17th, 1909 – Aged Seven Years-Thy Love To Me Was Wonderful.” They were taken aback and decided it was probably time to move on. Out of all the rooms that the Exploring with Fighter’s crew toured, one of the strangest was a side room that they found. It wasn’t necessarily a room, but more of a bathroom. While a bathroom isn’t exactly strange, this one had two toilets, side-by-side to each other almost like a public bathroom. This seemed strange to have in a mansion so big, but it can be assumed that this acted as the guest bathroom during parties or other get-togethers. One of the most astonishing aspects of the house was the attention to detail when it came to its interior design. The majority of the house’s walls are covered in wood, which is no cheap form of decoration. Furthermore, the staircase is nothing short of gorgeous as well as the archways that accent the entire house. Not only is this house massive, but it’s also beautifully crafted and unfortunately abandoned at this point. Although many of the items in the house necessarily lost their value, many of them still were worth something. One of these items was an old record player, which if refurbished, would probably sell for a lot of money. Yet, it was left behind like so many other things in the house. Although the exact year of the record player remains unknown, it’s clear that it’s not new by any means. The exterior also still looked to be in good condition. It seemed that all that would need to be fixed was the record player itself. While trying to open up what appeared to be a secret door that was locked, the team looked up to see a massive spider looming over their heads. While they have have been a little spooked, they weren’t entirely surprised considering that the house was absolutely covered in cobwebs. Almost every window and corner of the house was covered in spider webs, so it was clear that the house now belonged to the arachnids. All the cobwebs made the house look even older. Because the house was so nice, massive, and wouldn’t even need that much work, the crew thought it was a shame that it was going to waste. They figured the property could best be used as something like an orphanage, a school, or even an elderly home. It had so much potential to be used to do something good. Unfortunately, it was just sitting and rotting away, something that was hard to see done to such a beautiful property. Something that was especially curious was that the yard and outside of the premises were still clearly being maintained. It looked as though it was looked after at least on a weekly basis, most likely by hired gardeners. The team assumed that this was on the neighborhood’s behalf so they didn’t have a house that looked clearly abandoned in their very affluent area. But that begged the question: why isn’t somebody doing something about this beautiful home that is essentially going to waste? Even though some parts of the house may be worse for wear and the entire place is covered in cobwebs, it really is a beautiful piece of architecture and design both inside and out. It’s incredible how good it still looks even after 10 years of being completely ‘abandoned,’ save for those who have entered to see the place for themselves. The question is what’s in store for the property in the future? Will it be left to collapse on itself or eventually be restored to its original glory? Only time will tell.